The introduction of OS X, Cocoa and the general fusion of high function, usually UNIX and scary command-line based applications and very accessible graphical user interface design has ushered in a whole slew of new and highly useful science applications for my beloved MacBook Pro. Combing through the list of Apple’s favorites, I uncovered an amazingly useful program: Schnippselchen (crude german translation “Tiny Snippets”). I’m a very disorganized person – this is a fundamental truth. And the life of an Epidemiology graduate student, I’m beginning to suspect, is an unending stream of chunks of code in the statistical package of your choice (in my case, SAS). These two things, and the tendency for complex code to be easiest to write by assembling previous examples, do not normally mix well. Combing through page after page of code looking for “that one time when I got my graph formatted perfectly”, especially if you’ve forgotten to comment your code like a good little programmer, has led to hours of wasted time. Hopefully, this program will take care of that. 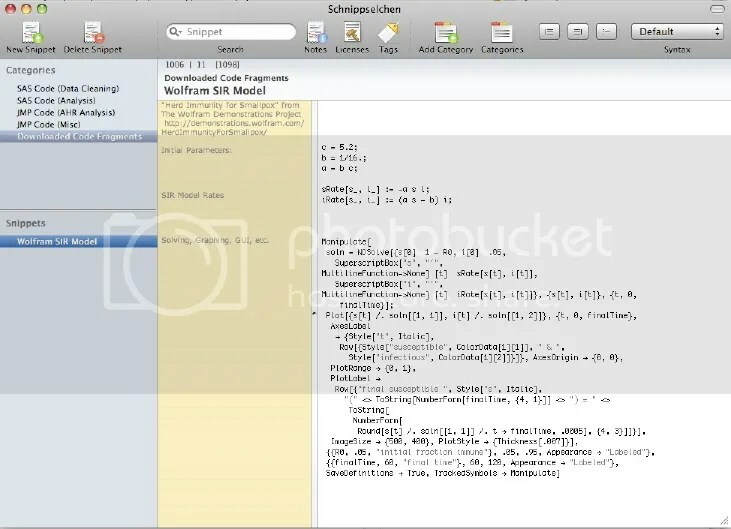 Free, and available from MOApp Schnippselchen is essentially a program for organizing code fragments, independent of the program they were written in. “Snippets”, or fragments of code, can be saved, categorized under different headings, and accessed through a very intuitive UI, or a search feature. There is also a separate sidebar for annotating your code. A screenshot below illustrates an example, the code for a very simple SIR smallpox model available from Wolfram. Overall, I have to say I’m very, very satisfied. Now I just have to comb through pages upon pages of uncommented SAS code to find what I actually want to save. But at least now, I have a shot at it.